Rick and JoAnne headed to the North Rim of the Grand Canyon. 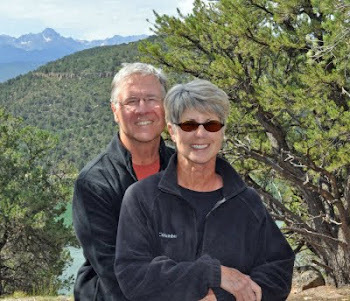 Doug and Janis are heading back to Broomfield and tomorrow Ty and Jane will travel with Hal and Lois back home. We had a great time meeting up with everyone in Zion and are already thinking ahead to our next "group" RVing adventure. T2 pulled up stakes at around 7:30 AM and headed south. Our first stop along the way was at Pipe Spring National Monument. This is one of those little mostly unheralded stops that jump up and surprise you. This very small old “fort” is oozing with history. Ancestral Pueblos, Paiutes, Missionaries, and Mormon Pioneers have inhabited the site. We enjoyed wondering the grounds and gaining some insight into how the rugged individuals who settled this land lived and died. It was then off to Jakob Lake and their famous cookies. This is really just a wide spot in the road at the junction where 89A East heads to Page and South to the "Big Ditch" - The good news is that we have to come back through Jakob Lake on our way back from the Canyon. We lucked out a got a spot in the "fully booked" Grand Canyon campground. It didn't have hookups but our Air-card is working and the little general store has Wi-Fi. Now just to spend some time taking in the splendor of the Grand Canyon.